They are connected to http://www.rugby-halle.de/ which are hosting Germany’s best Beachrugby Tournament. 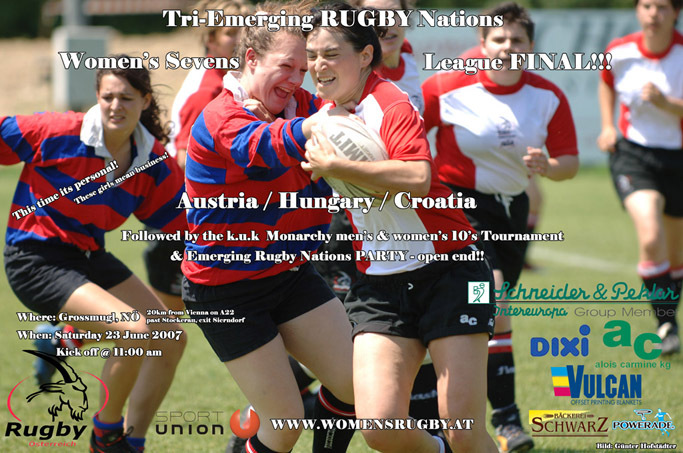 10a-side Rugby for men and women, beer, schnaps and BBQ! The German University Championships are open also to foreign Teams, but the members need to be students!! Stockholm Exiles RC have the pleasure of inviting entries to the 2007 Stockholm International Ten’s which is being held for the 15th year in succession, with the same main sponsor as in 2006. The Ladies’ Open will compete for the Stockholm Ten’s Cup and The Plate (places 9-16). The Old Boys and U19 teams compete for the Stockholm Tens Cup in each class. ENTRIES: Entries will be accepted in order of completed entry forms being received by latest May 1st and payment of entry fees being received by latest May 15. To ensure inclusion in your chosen class, we suggest you submit your entry form at the earliest possible date. Note – Ten Places in the Men’s Open and six in the Ladies’ Open will be reserved for Swedish entries. The organisers reserve the right to change the number of entries in each class if deemed necessary and to determine which entries are accepted.